May is finally here and things are heating up at Myrtle Beach! Whether you are coming down for a well deserved week-long break or are just in town for a quick Memorial Day Weekend getaway, you won’t want to miss out on all of the fun spring activities taking place this month. Take a look at the top Myrtle Beach events for May 2017! Take your family out to the ballgame by grabbing tickets to see the Myrtle Beach Pelicans! An annual tradition for many, this minor league affiliate of the Chicago Cubs knows how to keep a crowd entertained. Each game features fun between-inning entertainment and giveaways, in addition to exciting weekly promotions. Aside from being a great way to create special memories as a family, tickets to the Pelicans games are rather affordable. Call (843) 918-6000 for ticket information. Get out and enjoy the scenic south end of Myrtle Beach with a little south of the border flare at Cinco de MarshWalk! This new event will span the entire length of the popular inlet-front MarshWalk and each local restaurant is getting in on the fun. Restaurants will feature festive food and drink specials along with live entertainment throughout the afternoon and evening. There will also be family events in the Wahoo’s parking lot and giveaways throughout the day. You won’t want to miss out on the fun! The event will begin at 5pm and run through 10pm. The fun runs from 11am – 4pm and admission is completely free. Guests wishing to sample items can purchase food tickets for $1 / each and then trade the tickets for samples at the vendor of their choice. The event will also include activities for the kiddos, like face painting and bouncy houses, as well as live entertainment. Craft beef lovers and families alike are sure to enjoy the lively events at the 31st Annual Rivertown Music & Craft Beer Festival. Enjoy mouthwatering food samples from local restaurants and local food vendors, in addition to an impressive array of craft beer samples from around the world. Families will also enjoy the classic car show, family-friendly activities, and live entertainment. The lineup for this year’s festival includes performances from Southern Cross, Special Blend, and PaperWork. This event is free to attend; visitors will simply pay for food and beverage samples. Lovers of 90’s music, rejoice! Edwin McCain is performing LIVE this May at the North Myrtle Beach Sports Complex. Known for his romantic flare, Edwin has become a world-renowned performer and travels the world to share his iconic music with fans. Hear hits like “I’ll Be” and “I Could Not Ask For More” in addition to catchy covers. This outdoor concert will kick off at 7pm at the Sports Complex Amphitheater. Tickets may be purchased online via the Salt Air Jam website. Enjoy lively, patriotic themed music and the beautiful spring weather at the 3rd annual Pops in the Park celebration. Hosted by the North Myrtle Beach Community Band, the evening will begin with an opening performance from The Stardusters BIG Band, followed by the band performance, which will include elements of swing, opera, and plenty of patriotic flare. Guests are invited to bring out blankets and chairs and enjoy this free concert from 5:30pm – 7pm at the North Myrtle Beach Sports Complex amphitheater. Craving a little fresh seafood during your trip to Myrtle Beach? If so, be sure to check out the Blue Crab Festival along the scenic waterfront in Little River. This annual event is popular among visitors and locals alike and features tons of fresh and creative seafood dishes with a particular emphasis on blue crabs, a regional delicacy. Crab cakes, crab fritters, crab mac and cheese, crab sandwiches – you name it and you’ll be able to find it at this mouthwatering event! The weekend will also feature more than 300 local vendors, activities for children, and plenty of live entertainment to keep you busy. And don’t fret – there will also be plenty of food for visitors who aren’t a fan of seafood and plenty of beverages to help wash it all down! Admission is only $4 in advance or $5 at the gate (children 12 & under are free). The festival will take place from 9am – 6pm each day. Which Myrtle Beach event are you most excited for? Whether you are looking to enjoy a cool, refreshing beverage after a busy day at the beach or you want to refuel before you hit the town for a night full of fun, happy hour is a Myrtle Beach staple. If you are looking for the best deals in Myrtle Beach – we've got the scoop! Our list includes family friendly destinations that offer happy hour daily and that include both food and drink specials. Conveniently located at Broadway at the Beach, Liberty Brewery & Grill is always a top contender when it comes to happy hour. Specials area available daily from 4pm – 7pm in the bar area and beer garden throughout the busy season and extends to 4pm – 8pm daily in the off-season. Selections include $1 off Liberty pints, $10 Liberty beer pitchers, and $4 house wines, and discounted appetizers – to name a few. This is a great spot for beer lovers, sports fans, and families alike as it offers a casual, “come as you are” atmosphere and a convenient location to all of the action at Broadway at the Beach. Call (843) 626-4677 for more information. Looking for a great place to people watch? Or, do you want to get in some shopping during you trip? If so, Gordon Biersch at Market Common is the perfect place to take a break and enjoy a craft brew… or two. This family friendly brewery and restaurant is known for tasty craft concoctions and fantastic happy hour food deals. Specials are offered daily from 4pm – 7pm and include $3.75 – $4.25 craft drafts, $3.75 house wines, $5 select martinis, and discounted appetizers and snacks. Call (843) 839-0249 for more information. Enjoy an upscale vibe with a few happy hour drinks at Soho! Recently renovated, Soho offers a new location, a completely remodeled design, and a trendy rooftop bar area. Happy hour deals include $2 domestic bottles, $3 house liquor, $4 house wine, and deep discounts on Soho’s signature sushi and appetizers. Happy hour is available daily from 4pm – 7pm. Call (843) 433-9441 for more information. Guests looking for a great Barefoot Landing happy hour spot will definitely want to check out Flying Fish Public Market & Grill. 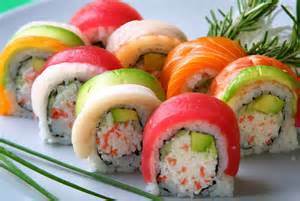 This seafood centric restaurant offers the absolute best happy hour on that end of town with deep discounts on their generously sized appetizers and sushi rolls and a full slew of discounted drink options, including signature margaritas and fishbowl drinks. Flying Fish also offers killer waterfront views and a convenient location to all of the fun and excitement of Barefoot Landing. The Flying Fish Happy hour is offered daily from 4pm – 7pm in the bar area. Call (843) 663-3474 for more information. Where is your favorite happy hour spot in Myrtle Beach? Let us know! Are you searching for the perfect Myrtle Beach Resort for your family getaway? If so, look no farther than Sea Crest Resort! Located along the bustling “south end” of Myrtle Beach, Sea Crest Resort is perfect for families of any age or size. Spacious suites and an on-site waterpark are just a few things that keep guests coming back time and time again. Guests at Sea Crest Resort won’t have to look far to find fun and affordable family friendly entertainment. Nearby attractions include Family Kingdom Amusement Park, shopping and dining at Market Common, and tons of attractions at Broadway at the Beach – all located within just a few minutes of the resort. And, one can’t forget about the beach! After all, that is the main reason for your stay. Sea Crest is located oceanfront, meaning that the pristine, sandy shores are just a few steps from your door. Guests won’t have to worry about fighting for parking, dragging sand into every crevice of the car, or any of the other potential beach nuisances. Instead, step right out onto the sandy shores. 2.) Room for Everyone with Room to Spare! With an impressive 14 unique room styles, one would be hard pressed not to find the perfect place to call your home away from home. Are you a couple enjoying a romantic getaway or an extended “snowbird” vacation? If so, opt for one of our cozier units like the King Efficiency Suite or the Angle Junior King Suite which are ideal for guests looking for a more intimate experience with all of the comforts of home. Larger groups or families with children will definitely want to opt for one of Sea Crest’s larger units like the Oceanfront Executive Suite or the Oceanfront Queen Suite which provide more sleep space and larger common areas. Sea Crest also offers units with full kitchens and units with Jacuzzi tubs, making it easy to find exactly the hotel room or condo you are looking for. Take a Virtual Tour of our Myrtle Beach Hotel rooms to see our spotless interiors. Whether you enjoy basking in the sun for hours on end or if you prefer lively entertainment and good eats, there is truly something for everyone at Sea Crest. After you spend the way enjoying wet n’ wild run, be sure to stop by Malibu Oceanfront Beach Bar to refuel. Open throughout the spring and summer, Malibu serves up scrumptious beach fare that is sure to please even the pickiest palate. Selections include salads, appetizers, sandwiches and wraps, fried baskets, burgers, and more. Malibu also serves up creative tropical cocktails sure to keep you cool and is a great place to find live entertainment throughout the summer. Other popular on-site amenities include the Mini-Mart & Souvenir Shop – perfect for picking up a few last minute items, the Beach Java Café which proudly serves Starbucks Coffee, and the recently renovated exercise facility. By staying with Sea Crest Resort, guests are automatically entered into the “Free Stays Program”. We are one of the very few hotel groups in Myrtle Beach to offer such a generous loyalty program that allows guests to earn points towards free nights. And, despite what you might be thinking, this program really is FREE – no enrollment fees, no membership dues, and no reservations fees. Be sure to ask your reservations specialist for more information about your Free Stay Membership! 5.) … All of This at a Price You Can Afford! We know that a family vacation can quickly escalate into a costly endeavor – but it doesn’t have to! Sea Crest Resort is dedicated to providing a memorable family vacation experience at a price you can afford. Be sure to check our hotel deals page to find information on current specials and to see how much money you can save! What is your favorite part about Sea Crest Resort? Let us know!